Login into the website by clicking Login on the top right hand side using your OGS credentials (the email you have given us and your password). If you have forgotten your password please reset it using the Lost your Password option. When you have logged in you will be automatically moved to the My Account page. 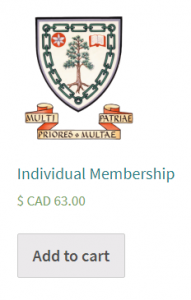 Click on Individual Membership or Family Membership, whichever applies to you. Click on Add to Cart for appropriate Membership. Scroll down to add any branches or donations to your cart (Branches are in alphabetical order so you will need to go to the next page if necessary). Click on the box with the shopping cart icon. If using the Grow our Family Coupon, please put the coupon number in the box that says coupon and then click Apply coupon. The discount will calculate automatically. Click Proceed to checkout. Choose payment option and choose Payment method. If you choose Cheque payment please send a cheque to the office. The order will be completed once the cheque is processed. Then Click Proceed to payment. Again, you DO NOT NEED A PAYPAL ACCOUNT to complete your payment by Credit Card. If paying by credit card choose the Credit card option and follow the instruction below. Click Proceed to Payment (PayPal is the company we use to process credit cards). Click the box that says” Pay with Credit or Visa Debit. The last screen will ask if you would like to create a PayPal account; click on Not Now.